It’s real…video game addiction. Parents are struggling with their children’s addiction to many of the video games that are popular right now, so much that some are even seeking professional help. It’s hurting kids’ sleep, grades and their activity level. As a parent, it’s so hard to monitor the video game time. You can lay down the laws, you can hand out the consequences, but you can only monitor so much. As a busy parent, you are cooking dinner or helping another child with homework and before you know it, the game system has been turned on and sucking another child into its grip. Here are some scary statistics. In the U.S., approximately 183 million people play video games on computers, consoles, tablets or phones. This includes 99% of boys under the age of 18, and 94% of girls under 18. Across the world, it equates to three billion hours a week spent playing, prompting the World Health Organization to evaluate the detrimental effects of all of this gaming. After research, WHO has classified “gaming disorder” as a real addiction, negatively affecting players’ personal, family, educational, social and occupational lives. What can you do if your child is developing a need to play so often that it is disturbing their normal life and causing them to neglect school work, friends and family, and healthy sleeping habits? These steps may be a good start to combat the onset of video game addiction. The first step should be to sit down and really talk to your child. Let them know the harmful effects of too much gaming. Tell them that gaming is part-time entertainment, and not what real life success is all about. And, while gaming is fun in moderation, their families, their school work, and learning real life skills are what really matters in the long run. This will help them keep it in perspective. Spend a week or so tracking your child’s gaming time and include this in your talk. It will make both of you aware of how much time he or she is actually playing and may be a wake-up call for both of you. Then, include your child in a discussion on how you can cut that back. It will empower them to be a part of the solution. While it’s good to include your child in the discussion on gaming, don’t forget that you’re the parent. Ultimately, you get to set the limits and make the rules for your child’s well-being. The first limit to set is on playing time. Because it’s easy to lose track of time when playing, set a kitchen timer or a timer on your phone. When the timer goes off, the game goes off. This timer acts as a buffer between you and your child so that you’re not always the bad guy. It’s important for your child to know that they can play in moderation, so choose a specific number of hours for them to play each week and then stick with it. Or, you may also want to let him or her play only on certain days, like the weekend or only after homework is done. Write these time limits down and post them on the refrigerator or near the game console so there will be no room for argument. In addition to time limits, it’s a good idea to put boundaries on where they can play video games. If you can keep their consoles or computers in common areas like the family room, then you are on hand to monitor not only their game time, but also whether games are age appropriate. Plus, recent studies show that video game play time dramatically increases from an average of 49 minutes a day to three hours when consoles are kept in a child’s bedroom. Keep your children’s bedrooms screen free. Not only does this help limit play time, but it also contributes to better sleeping habits as screen time generates excitement and emits a “blue light” glow that stimulates their brains and suppresses the production of sleep-inducing melatonin. One way to get your children motivated in other areas of their lives is for you to give game time as a reward. If all of their homework is done correctly or they ace a test, let them play on a school night. If they clean their room or help a sibling with a project, then give them an extra half hour. This is a great way to show them that other aspects of life take priority to gaming. And, when you have fulfilled your obligations of school work, chores, exercise, then that is the time to bust out the video games for a little entertainment. After you’ve discussed video game limits with your children, help them find other healthy ways to have fun and occupy their time. If they love art, buy them a new sketch book or art supplies. If they show an interest in cooking, then find a cook book at the library or sign them up for a cooking class. And, it’s always good to find some entertainment that encourages physical activity like organized sports or unorganized play time. The collection of glow games at Starlux Games offer the thrill of video game strategy, but with the healthy benefits of being outside, active and socially interactive. 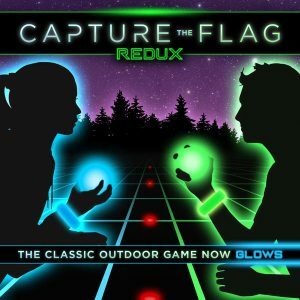 CAPTURE THE FLAG REDUX is the classic game revolutionized for today’s generation using glow in the dark LED lights. Your children will love the glowing nighttime excitement and you will love that your kids are outdoors, unplugged and moving. 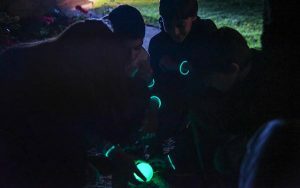 GLOW BATTLE is a an active glow in the dark battle game that is way more fun than staring at a screen and a fun way to get some energy out of your kids once the sun goes down. Both are available at our online store. Teenagers love to sleep in late, they love pizza and junk food, they love having attitudes, but above all, they love their phones. They text on their phones, they take pictures on their phones, they play music on their phones, they play games on their phones and they send goofy faces to their friends on their phones. Ironically, the only thing they don’t do on their phones is talk. Obviously this makes most parents worry that their teens are spending too much time on their phones and missing out on valuable social interaction and physical activity. In addition, a recent study from Pew Research Center revealed that even teens (over half) worry that they spend too much time on their phones. What does it take to get the phone out of their hands? Teenagers need incentives to let go of their phone addictions, get outside and get active. If you have a phone-addicted teen, check out this list for some active and very fun outdoor games for teens to help your teen develop some healthy addictions. As a teenager, sometimes it’s hard to find a friend that’s available to hang out, and sometimes it’s just nice to be by yourself. That doesn’t mean that you can’t stay active. Maybe now’s your chance to try something new without any embarrassing looks from others – like learning how to ride a skateboard or roller blades. Or, maybe now’s the time to just spend a few minutes getting to know your own thoughts while you keep your body physically active. It’s a good time to go for a long hike on a trail or go biking on a bike trail, wash a car, or perfect your three point shot. Some physically activity and alone time might be just the ticket to boost your teen’s mental attitude. This is a fun activity for a solo teen that encourages creativity and physical activity. Create and master a miniature putt putt course in your yard. You can make your own with anything you can find at home such as plastic bottles or pool noodles or you can buy a kit such as the My Mini Golf set sold on Amazon. This kit consists of 13 unique course pieces – 9 holes and 4 fun obstacles like the wave, tower, volcano, maze and bridge, as well as two putting discs, one rubber ball and putter, a scorecard pad and mesh storage bag. It can be played indoors on carpet or flooring or outdoors on short grass or asphalts. It’s portable and adaptable to any competitive level The versatile 9-hole course lets you change configurations for a new course each time you play. It’s the ideal game to keep teens active after the sun goes down, and can be played with 2 to 10 players. Players use harmless glowing swords to strategize and take down their opponents. Physical activity becomes part of the fun as players run, jump and swing at each other to win. Each game box comes with 10 weapons, 10 glowing wristbands, 8 regeneration station markers and 10 game playing cards with different game variations like the Gladiator version for just two people. Each player gets an air mesh vest and three balls. Pick your color and take 20 steps from your opponent. Say “go” and start to throw, dodge, duck, run and dive. Whoever is the first player to get all three balls stuck on their opponent’s vest is the winner for that round. The air mesh vests adjust to almost any size. There is also a version with slime balls and a sticky vest where players throw squishy slime balls at their opponent and try to hit the green target on their vest. This is the perfect two-player game to keep teens on the move. Maybe this game doesn’t have the coolest sounding name, but this outdoor game is actually very challenging and highly addictive. It includes two knock off stands, a flying disc and a storage bag. Then, you provide the the targets to put on the stands. That’s where the fun comes in. You can use whatever you want – plastic bottles, cans, cups, water balloons or toys. Divide into teams and take turns throwing the flying disc at the first team’s target on the stand while the second team stands on the opposite side ready to receive it. Teams score points when the target is knocked off the stand or when the receiving team fails to catch the flying disc. The disc must be caught every time you throw and the target must be caught after it’s hit. The teams keep playing until someone reaches 21 points and wins by two. The best part is that you can take this with you and play on any surface – grass, hard floors or sand – anywhere teens would want to hang out! When they get the chance, most teens love to hang out in a group, and keeping them all active may seem somewhat daunting without the right entertainment. Anytime they can get outside and play a somewhat organized game is a great way to get some of their teen energy out. One way to bring out some laughter, is to play a three-legged version of almost any type of sport. Have the teens split find a partner and tape or tie their two inner legs together with a rope or bandana. Then split the pairs into teams and play basketball, volleyball, kickball or even tag. For more organized games for multiple teens, try one of the below games available on Amazon. Sometimes all a group of teens wants is a game that gets them outside and hanging out together. BucketBall is perfect for this. Simply set up two sets of six buckets in triangular formation separated 15-25 feet apart. Then, divide into two teams and take turns throwing the ball into the opposing team’s buckets. Each player on a team tries to throw the ball and if a ball goes into the opposing team’s bucket, then that bucket is removed from the game or stacked inside another bucket. The first team that makes all of the buckets is the winner. The BucketBall starter pack includes 12 sturdy buckets – six of each color – 2 hybrid balls, a tote bag and instructions. Today’s generation of teens will love this Capture the Flag REDUX game that uses glow in the dark LED lights. Each kit includes 25 battery-powered, reusable lights that transform playing fields and players into glowing teams of blue and green. Complete with lit jail markers, territory lights, light-up wristbands and glowing crystals that serve as each team’s flag, this is truly a modern twist on a classic game. Plus, each game comes with 12 exciting game variation cards. Learn more here. Most of us parents today acknowledge that our kids and teens are spending way too much time on their screens (phones, tablets, computers, video games, TV…). But, it’s so hard to actually do something about it when your kids are being good and quiet and watching a video, playing a game on their tablet or texting friends on their phones. It’s all too easy for us to let them stay on their devices while we actually get a room cleaned, pay the bills or pour another cup or coffee and enjoy a few more minutes of peace. But with the American Heart Association now warning parents to reduce screen time for kids and teens to a maximum of two hours a day, we must make a change. Two hours…that’s a drastic difference from the average of seven plus hours that research shows kids ages 8 to 18 are currently spending on screens. As parents, we must wake up and realize that kids that consume too much screen time are at a higher risk for obesity, have lower grades and even have poorer sleep quality. And, while we can recognize that technology isn’t all bad, we still need to step in, limit screen time and teach our kids to use it in healthy ways. We need simple steps to make a change and encourage our children to spend more time incorporating healthier activities in their lives like playing outdoor games, participating in sports, reading real books, getting exercise, and being social and interactive with other people instead of being alone with their tech device. These few simple steps can help you open the conversation about screen time with your kids and make a change for the better. First of all, talk to your children about balance in their lives. Not just once or twice, but an ongoing dialog where they can contribute their thoughts instead of you just telling them right and wrong. Let them know that balance in everything they do is important for their growing bodies and their growing minds. That is why we make time to play, hang out with friends, participate in sports, study, eat and sleep. They should know that technology is a great way to learn, connect and create and that you want them to use it to their advantage and not to their disadvantage. Discuss alternate activities that they like to do such as sports, friends, baking, reading and the benefits that they get from each of these compared to their phones or tablets. Post articles on your refrigerator about the advantages of playing outside and getting exercise. This constant positive reinforcement will create a lifetime of healthy thinking. Sit down with your child and create a balanced schedule for their free time. For younger children, start by making a free-time schedule with pictures that shows a time for active play, a time for reading, a time for outdoors, a time for chores and a time for video. That way they can see the balance. No age is too young to start a conversation about the importance of being healthy and what a difference it makes in your life. Let older kids and teens be involved in making their own schedule. The more you plan with them, the more they will feel like they are in control of their lives. Stress the importance of getting schoolwork and chores done first and then dividing their free time into a balance of the things they enjoy – sports, art, socializing, and then screen time. Choose rooms or specific times in your house that are screen free – for example, no screens at the dinner table. This not only disrupts family bonding, but also makes it difficult to focus on the amount of food you consume and may lead to overeating. Many families choose to make bedrooms free from any phones, tablets, TVs and computers. That way, kids can’t disappear for hours on end into their rooms with their devices. Not only does screen time generate excitement from staying up late and being on devices, but electronic screens also emit a “blue light” glow that stimulates their brains and suppresses the production of melatonin preventing kids from feeling sleepy. Instead, encourage your child to use screens in common areas where you are around to monitor usage. For example, if they are in the family room or kitchen, then you are nearby to ensure that they are not on inappropriate games or websites. One of the most important things that parents should remember is what they do is equal to or more valuable than what they say. Practice healthy screen usage and cut down on your own devices while you are with them. Don’t constantly check emails, turn on the TV, and check your phone at stoplights. Be fully present when you are with your kids. Put down your phone, play with them, listen to them and be engaged. Think of some family fun, device-free activities that you all enjoy and post a list of ideas on your fridge. Ride bikes together, go to the park or library, or plan a family game night with board games. When they see you enjoying these activities, they will pick up on it and do the same. Think about what non-screen activities that your kids really like doing and expand on them. If you child enjoys art, then sign them up for some classes or buy them some new paints. If they like sports, then set up that a soccer goal or take them to a game. Or, if they love to be social, find some fun options that they can play outside with friends. 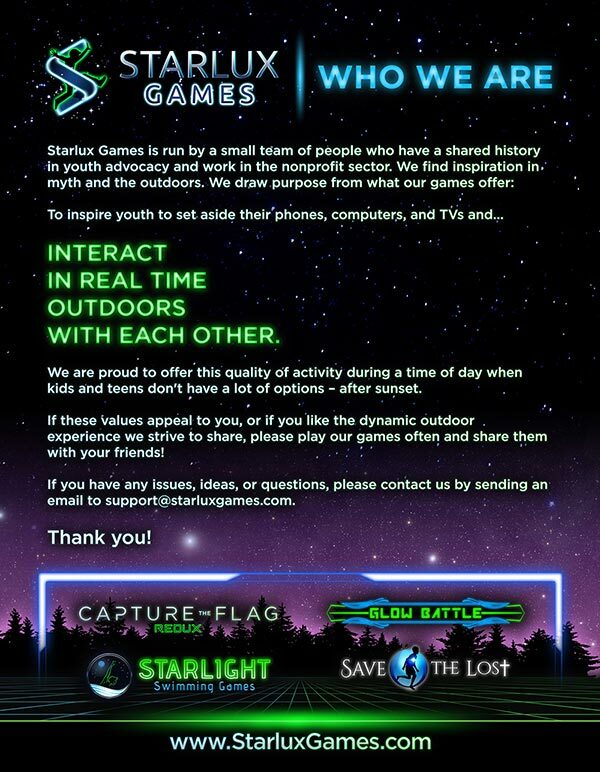 Starlux Games offers great ways to be outside, active and socially interactive. 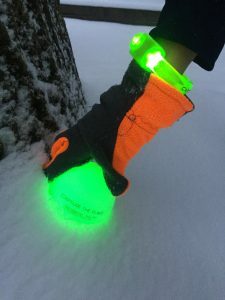 CAPTURE THE FLAG REDUX from Starlux is the classic Capture the Flag game revolutionized for today’s generation using glow-in-the-dark LED lights. Kids will love the glowing nighttime excitement and parents will love the fact that their kids are outdoors, unplugged and moving. 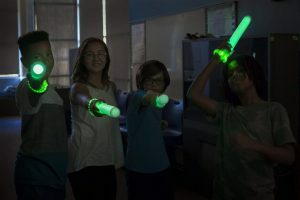 Also from Starlux, GLOW BATTLE is a an active glow-in-the-dark battle game that is a wonderful way to get some energy out of your kids once the sun goes down and is way more fun than staring at a screen. Both are available at https://www.starluxgames.com.